Less than 24 hours after the Hartford Courant reported that post offices in Connecticut would not collect toys for the Marine Corps' Toys for Tots program, the Postal Service had a change a heart. After participating in the program for 15 years the Postal Service decided post offices across the state could not collect toys this holiday season for the Toys for Tots program, because asking customers to donate has been deemed a form of solicitation that violates a U.S. Postal Service policy. "We are going to put the boxes back," Maureen Marion, a postal service spokesman, said Thursday night. "In those offices that have traditionally had Toys for Tots boxes, they will be restored for this season." Last Friday toy donation boxes began disappearing from post office lobbies after officials interpreted that federal regulations prohibit solicitations on postal property. But upon further review, Marion said, the boxes will be coming back. "We should have brought other postal officials into this discussion," said Marion, adding that "we will revisit how to interpret the law and how it affects those involved." Translation, we will try to stop this program again next year. Add this to the War against Christmas file. 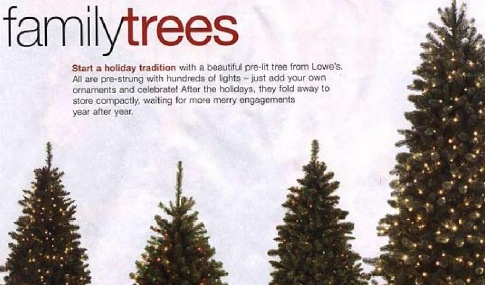 Lowe's Companies Inc., opened this year's war against Christmas by labeling Christmas tress "Family Trees." Lowe's apologized after the American Family Association posted an "action alert" on its Web site, asking readers to e-mail Lowe's about the "Family Trees:"
"Lowe's evidently did not want to offend any non-Christians, therefore they replaced 'Christmas Tree' with 'Family Tree,'" the association's Web site said. "Of course, if Christians are offended, that is evidently ok."
Lowe's spokeswoman Karen Cobb said the page's title was an error and inconsistent with the company's practice of referring to the trees as Christmas trees. Here's a video report about Lowe's politically correct "error" from WXII 12 News.